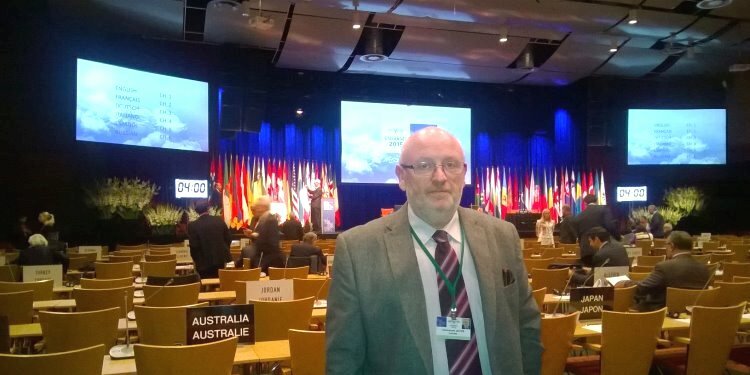 The 61st annual session of the NATO Parliamentary Assembly was held in Stavanger (Norway) from 9 to 12 October 2015. It was the fourth time that Norway hosted the NATO PA. Previous sessions took place in 1987, 1994 and 2009. The NATO PA brought together 243 delegates from the 28 NATO member states plus 23 associated countries from North America and Europe, as well as observers to discuss reports, recommendations and declarations. EUROMIL was one of the few observers present at the meeting and monitored during two days the Defence and Security Committee. The President of the NATO Parliamentary Assembly, Hon. Michael Turner, welcomed the delegates as follows: “A little over a year ago, allied Heads of State and Government, meeting in Newport in the United Kingdom, opened a new chapter in NATO’s history. Faced with the dual challenges of Russia’s aggression against Ukraine and the rapid spread of ISIS across the Middle East, Allied leaders both reaffirmed the enduring values and principles at the heart of the Alliance and agreed on a wide-ranging set of adaption measures. As importantly, our governments committed themselves to stopping and ultimate reversing the decline in our defence budgets. One of our main focuses here in Stavanger will be to review the progress achieved since the Wales Summit, and measure this against the ongoing – if not growing – challenges we face in the East and in the South.” However, he also reminded the delegates that at the same time one should not forget that there is “unfinished business” in Afghanistan and the Western Balkans. Concerning the latter Michael Turner stated that today, 20 years after the Dayton Peace Accords, it is now time for the region to move resolutely away from the legacy of the past and towards a future as fully-fledged members of our European and Euro-Atlantic family. “It is time to show that they are ready to walk through our open door” the Assembly’s President Turner concluded. The Defence and Security Committee was held over two days prior to the plenary session. The first topic on the agenda was a successful and much appreciated panel discussion with Ine Eriksen Søreide and Admiral Haakon Bruun-Hanssen, respectively Minister of Defence and Chief of Defence of Norway. The Norwegian MoD informed the delegates that just two days prior to the meeting, the Norwegian government presented the annual budget to the parliament and suggested a 9,8 % increase in the 2016 defence budget. In real terms, this represents 4,3 billion NOK, or close to 500 million Euros. The share of the Norwegian budget allocated for defence investments is 26,2 %, which is well above NATO’s target of 20 %. The Norwegian focus lies on high-end capability investments, especially for the F-35 and the Joint Strike Missile, as well as a considerable strengthening of the Norwegian intelligence service and increased naval and air presence in the High North. Next year, the Norwegian government will present a new long term plan for the defence sector, in which adaption to the new security situation will play a major role. Minister Ine Eriksen Søreide pointed out that it is her job to ensure the ability of the armed forces to defend their people and interests as well as actively contribute to NATO’s collective defence. She emphasized the need for openness and transparency about the Norwegian armed forces and the entire defence sector. “Such transparency promotes debate, increases the public’s knowledge and sets focus on defence related matters.Indeed, openness in matters where criticism is valid enhances our credibility when we communicate the substantial and excellent work that our men and women in uniform provide every day.” Ine Eriksen Søreide concluded. On his turn the Norwegian CHoD, Admiral Haakon Bruun-Hanssen, elaborated on NORDEFCO (Nordic Defence Cooperation). This Cooperation is not new to the Nordic countries, who apart from sharing similar history, language and culture, also have an intra-nordic record of cooperation in political and military areas. The Nordic Council, formed in the aftermath of the Second World War, and the Nordic Passport Union are examples of cooperation possible in spite of the substantially diverse foreign politicy circumstances under which the Nordic countries existed during the era of the Cold War. The military branch of NORDEFCO is divided into five Cooperation Areas (COPAs) subordinated to the Military Coordination Committee (MCC). The main task of the COPAs is to coordinate activities of the members in different areas, such as Capabilities (COPA CAPA), Human Resources & Education (COPA HR&E), Training & Exercises (COPA TR&EX),Operations (COPA OPS) and Armaments (COPA ARMA).. The COPAs can decide to initiate working groups for specific activities. The working groups will report back their results and recommendations on how to achieve positive effects within the activity. These recommendations from the COPAs form the basis for the agreements that are made in the Military Coordination Committee and the Policy Steering Committee. In preparation of their final adoption by the plenary session, the rapporteurs presented several draft reports, i.e. on NATO’s New Strategic Challenge, the post-2014 Security Environment and the realization of the Wales Summit goals. These draft reports were discussed in depth at the spring session 2015 and meanwhile fine-tuned by their respective rapporteurs. The refugee crisis was discussed on the occasion of the presentations of the draft reports and during the presentation on “Seaborne Migrations – Global experiences and lessons learned” by Peter Roberts of the Royal United Services Institute (RUSI). Peter Roberts made it clear that migration is a symptom, not a root cause. He also expressed the opinion that most refugees would prefer to go back home if a secure situation was created in their respective home countries. However, he continued, do we really want them to do so? This point of view was shared a day later during the plenary session when Jan Egeland, Secretary General of the Norwegian Refugee Council, addressed the Assembly. He argued that as long as we do not solve the problems in Syria, Iraq, Afghanistan, etc., the refugees will continue to come to Europe. On the other hand Egeland explained to the audience that even if we are convinced that there is a refugee crisis in Europe, 90 % of the refugees worldwide are displaced in or to poor nations. The crisis has not come to an end yet since every two seconds, a person is forced to become a refugee or is internally displaced. At the plenary session, NATO Secretary General, Jens Stoltenberg, addressed the Assembly. Opening his speech, Stoltenberg outlined the situation of the High North. “This is important for Norway and it is important for NATO. The high north is still characterised by low tensions and cooperation. But there are growing concerns. We have witnessed increased Russian military presence. And the region is not immune from developments elsewhere” the Secretary General argued. He continued stating that the security in the High North is important for the security of Norway but also for NATO as a whole. This brought him directly to the declining defence spending, stating that “despite the commitments, after the Cold War, and in reaction to more peaceful times, Norway and many other countries cut defence spending. I remember this well, as I was Minister of Finance in the 1990s.” The issue of defence spending and the decisions taken at the Wales Summit were unsurprisingly the main topics during the question and answer session. Closing his speech NATO Secretary General Stoltenberg laid the foundation for the rest of the nearly ninety-minute discussion declaring that “there is no contradiction between being strong and being engaged. On the contrary, I believe that a strong defence forms the basis for a constructive relationship with Russia. But there must be no doubt. Engagement is not the same as accepting a new status quo, or giving Russia a free hand. As we approach our Warsaw Summit, we will assess the long-term implications of the current crisis on our relations with Russia”. The three day long and highly intensive Parliamentary meeting was closed by the presentation of eight draft resolutions which have been thoroughly prepared and discussed during the Committee meetings. These resolutions cover several issues such as Russia’s propaganda and the sanctions against Russia, the climate change, terrorism, solidarity with Ukraine, the crises in the Middle East and North Africa, NATO’s Open Door Partnerships and last but not least maintaining support for the Wales Summit initiatives. The resolutions were unanimously approved by the delegates. The question remains whether they will be effectively and efficiently used in national parliaments or get lost in the archives? This will depend on the (national) NATO PA delegates! The spring 2016 session of the NATO PA will be held in Albania.